When a bike brand has been around for over 70 years, you don't ask "are they any good? ", you ask "when can I ride one?" 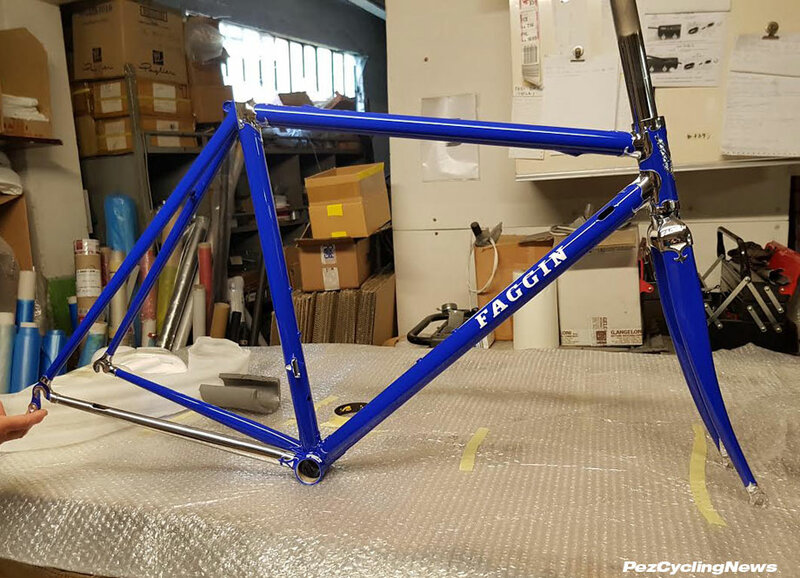 Italian bicycle frame builder Faggin (Say: Fah-JEEN) Accaiao DOGE road bike shows how good riding steel can be when it comes from the hands of a master builder. 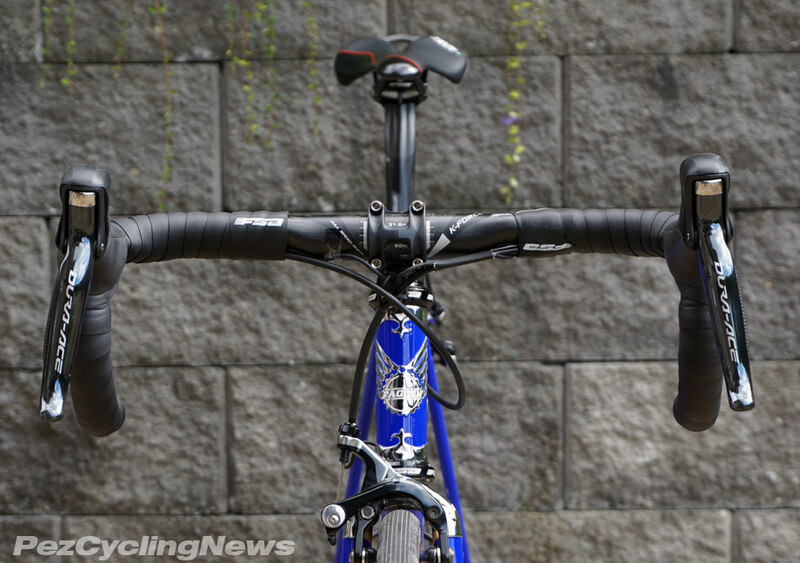 Here's the PezCycling first look. 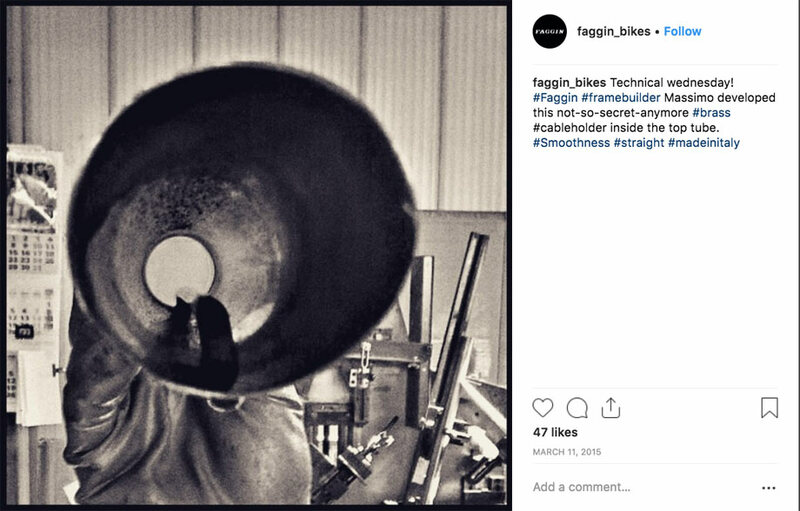 My guess is Faggin is a brand not many of you have heard of, and even fewer can pronounce correctly, but they've been building fine handcrafted bicycles for longer than most of you have been alive. The first comment when I posted my video to the PEZCycling Youtube channel referenced a derogatory slur. 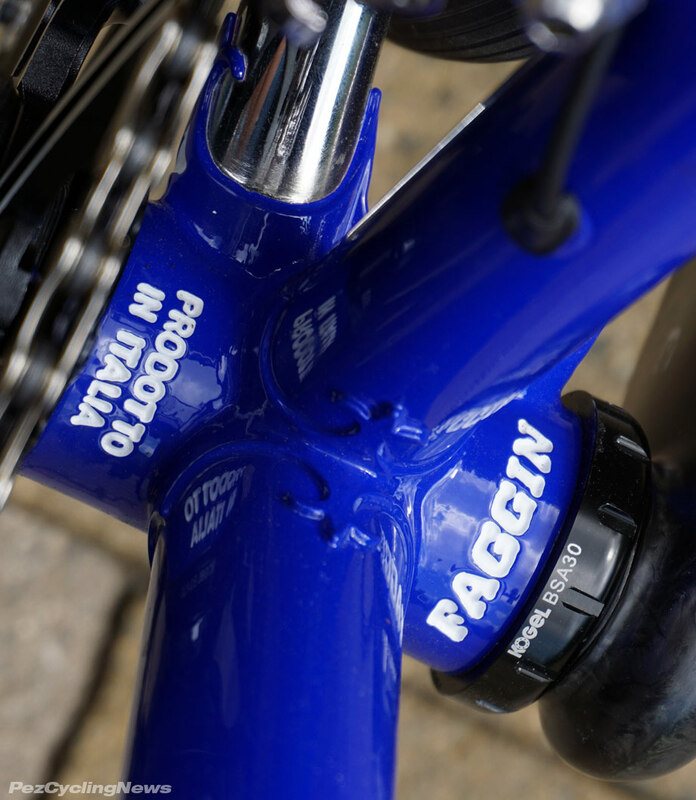 But if you're Italian, and know fine handcrafted steel road bikes, you'll know exactly how to say it. There aren't many brands in cycling that have been around since the middle of the last century, but it's a safe bet that Italy has a longer running history of cycling brands than any other place on earth. But since World War II, with the country in shambles and enduring international scorn as one of the defeated Axis powers, with no cars and worse roads, these terrible living conditions gave birth to a burgeoning cycling industry. Bikes were the only transportation that people could afford, and with some 45 million people needing to get around, demand for bicycles grew quickly. Small bike shops sprung up across the land, and the scarcity of jobs established a system of family run business across all industries that ensured the shops that turned into actual businesses had a lineage of management that could be trusted, and also guaranteed jobs to children family and friends of the founders. Marcello Faggin (say Fah-jeen) started his own bicycle company and employed all of his four daughters, one of whom runs the company today. The brand still operates today out of its original location in the north eastern city of Padua, focusing mostly on lugged steel road frames, with most of the production handled by just two employees - Marcello's daughter Maria Cristina and her husband Massimo. Perhaps most surprising is that she still works in production too - and can often be found fillet brazing their beautiful lugged frame sets. I got my first real road bike back in the mid-1980's - a lugged frame from a much more popular Italian brand - but even though I knew of the Faggin brand I'd never had the chance to ride one until recently, when I was contacted by William Sylvester of Oberland Imports - the brand's US importer. But since the '80's, most of my riding has been on aluminum and carbon road bikes - and only in the last couple of years did I swing a leg back over a steel framed machine. 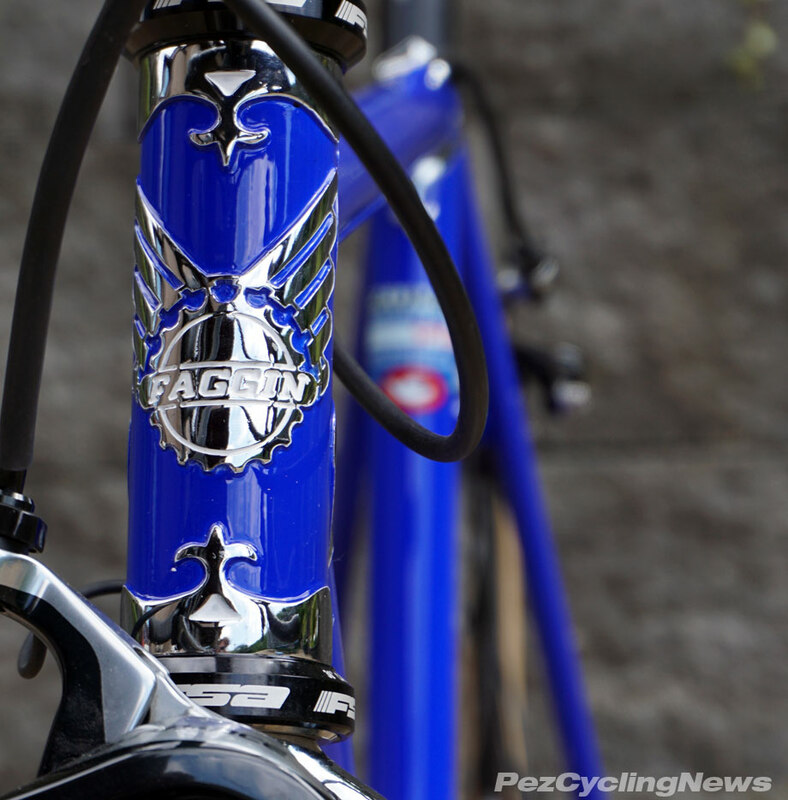 So he suggested I ride the Faggin Acciaio Doge, I was all over it. "Acciaio" is the Italian word for steel, but sounds way cooler (like most things do) - when you say it in Italian... say "ah-CHAI-ee-yo". 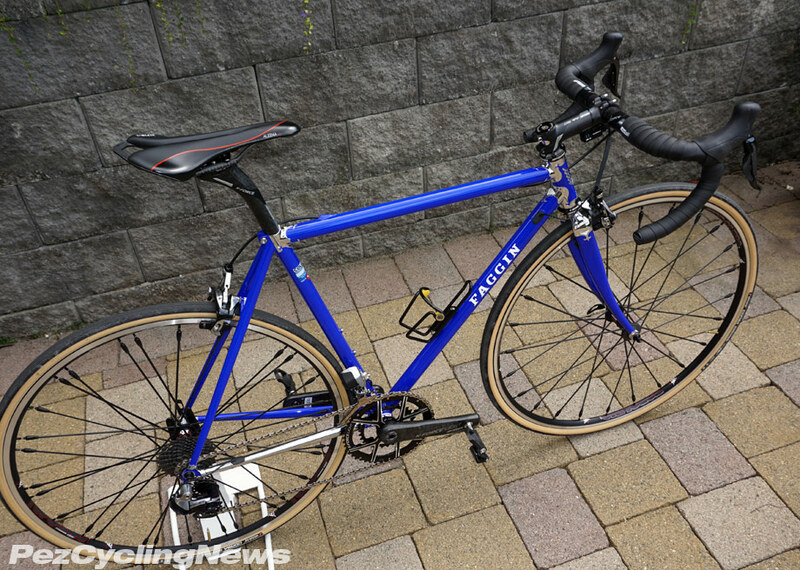 While Faggin has built 10's of thousands of frames over the years, supplied bikes to pro & national level teams, (anyone remember the Italian track squad's rigs at the 1980 Olympics?) and continue to build frames in all the popular materials, perhaps steel is what they do best. Lovers of steel know what a great material for bikes frames this is - because its ride quality, durability, simplicity, affordability, weight and customizability are just impossible to ignore. 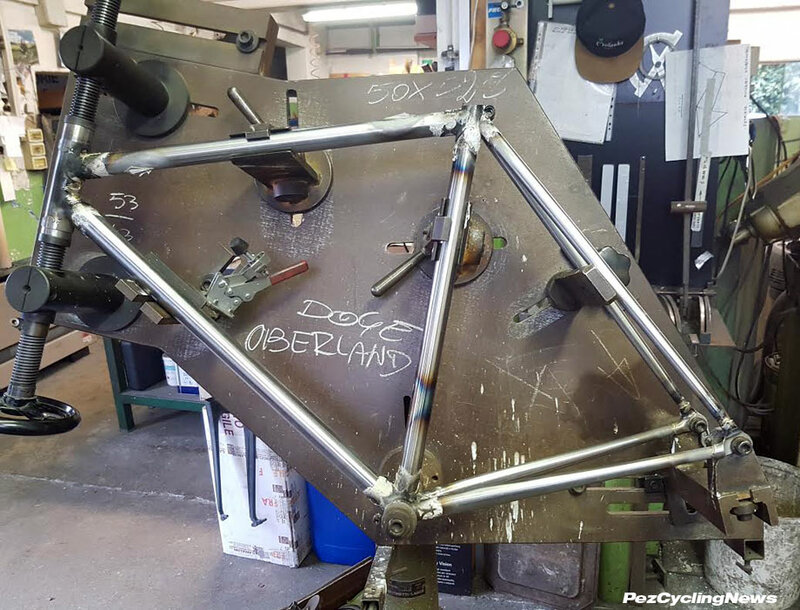 You'll never get a custom sized bike frame built less expensively than in steel. 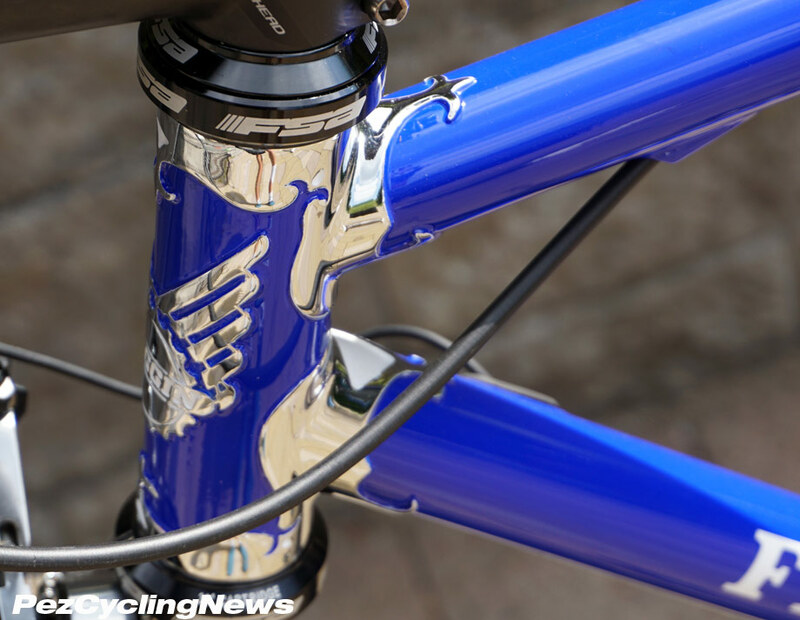 And it's easy to argue that no other material is as well suited to the artisanal hand of creating a bike frame with details that actually look different from every other bike on your group ride. Building lugged frames allowed for the precise joining of tubes using fillet brazing - a welding method that uses lower temperatures that won't alter or weaken steel alloy tubes. 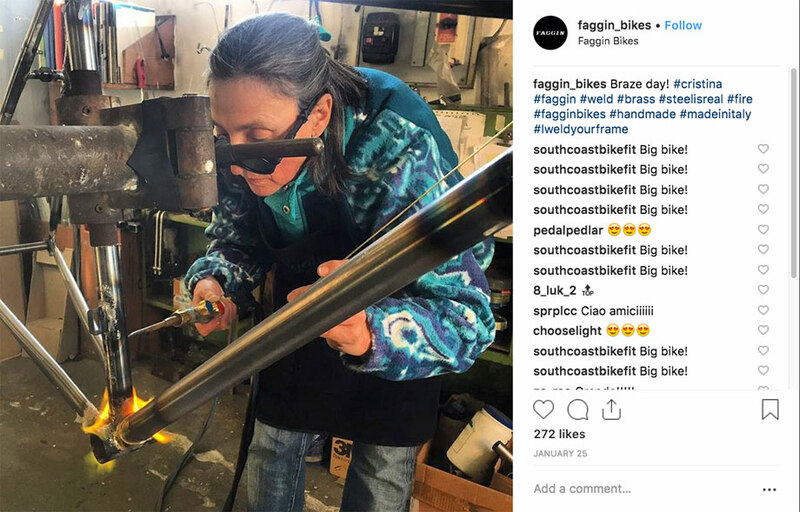 Fillet brazing requires precisely designed lugs at each tube joint to add strength to these connections, and over time, builders came to create signature designs for lugs that added a distinctly artistic quality to their brands and frames. The Faggin Acciaio Doge shows of some beautifully detailed lugs finished in chrome that really catch the eye, and ended up attracting the most compliments on my group rides. "Damn, that's a cool frame..." was the general theme. The "Doge" frameset on my tester is built "Columbus Spirit & Max Oversize tubing and cast lugs that recall the golden era of cycling". They call these tubes "oversized", which actually are slightly larger diameter and thinner walled than the more traditional steel tubes that you rode in the 1980's. Kogel supplies the full ceramic bottom bracket as well as the oversized derailleur pulleys. Kogel has European roots, but is actually based in El Paso, TX. A long time supplier to teams like United Healthcare, their bearing quality is on par with anything else in the market, but at slightly more palatable prices. With all of the various press fit standards out, it was nice to thread in a traditional bottom bracket for the first time in many years. 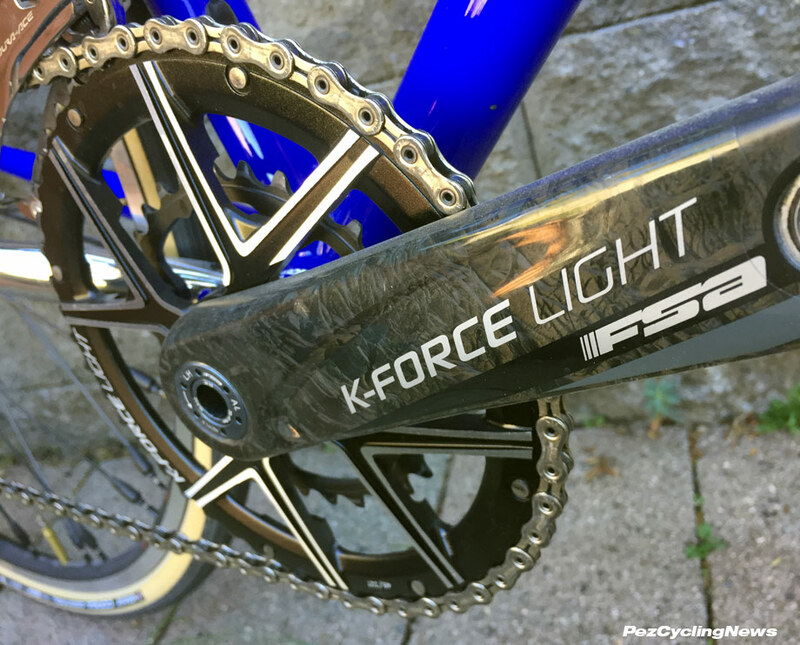 The FSA K-Force Light Super Compact Modular crankset is a sensible and plenty stiff setup, which is largely due to the rather beefy 30mm aluminum spindle…a spindle that barely fits through the bottom bracket shell of the Faggin. Sourcing a set of high-end cups with quality ceramic bearings wasn’t an issue though as Kogel have over 60 different combinations of bottom brackets available for various standards. Can I tell a difference between standard and ceramic bearings? Nope, and most of you can't either. What I do appreciate is a “set it and forget it” product that I know will run like butter for a long time. Does saving a watt here and there from ceramic bearings make a bit of difference when riding a bike like this? Absolutely not, but having my drivetrain run as quietly and efficiently as possible definitely matters to me. 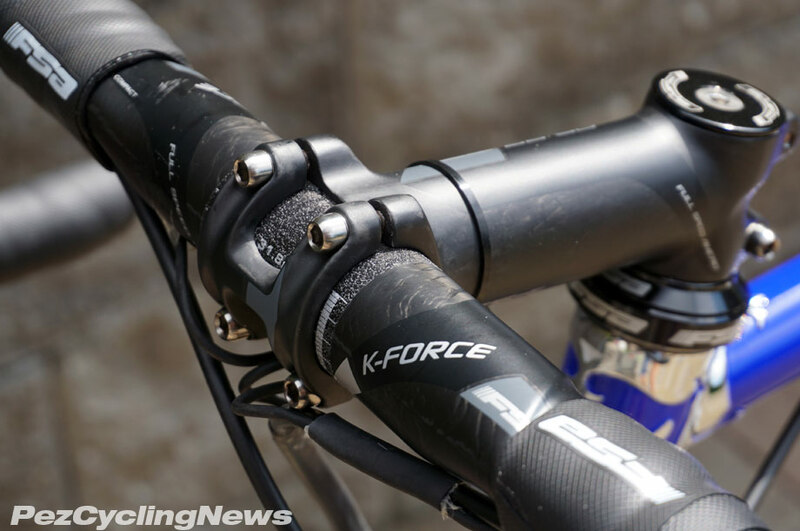 The cockpit is built with FSA K-Force carbon compact bars which I love for their shorter reach and drop, K-Force carbon seatpost, and OS99 stem aluminum stem, which has been a standard in the FSA line for years, notable for its light weight, stiffness, and clean and simple design that looks like it belongs on this round-tubed frameset. 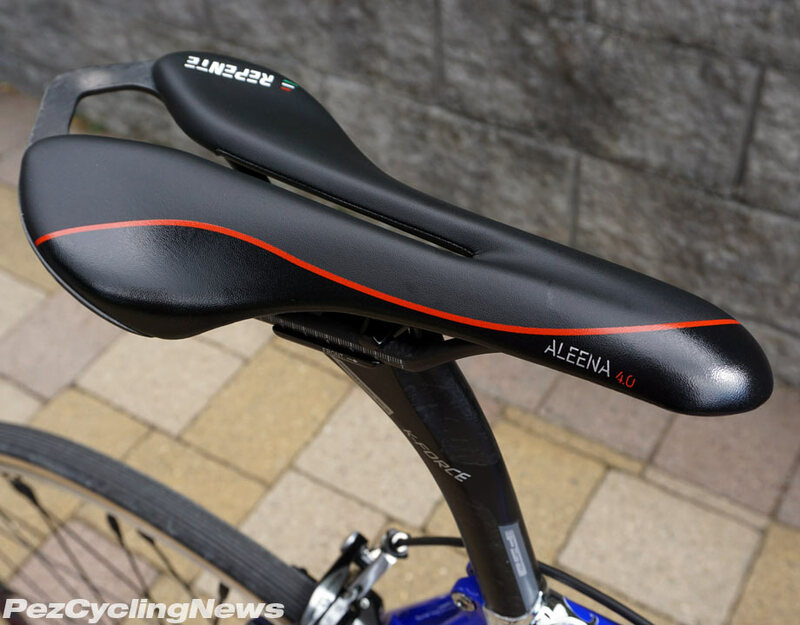 The Aleena 4.0 saddle is by new Italian brand Repente - who PEZ-Fans saw in our first round of Interbike coverage here. This cool design features a removable / swappable top padding that snaps onto a carbon fibre base & rails, allowing riders to choose between a variety of colors, foam thicknesses, weights and densities. 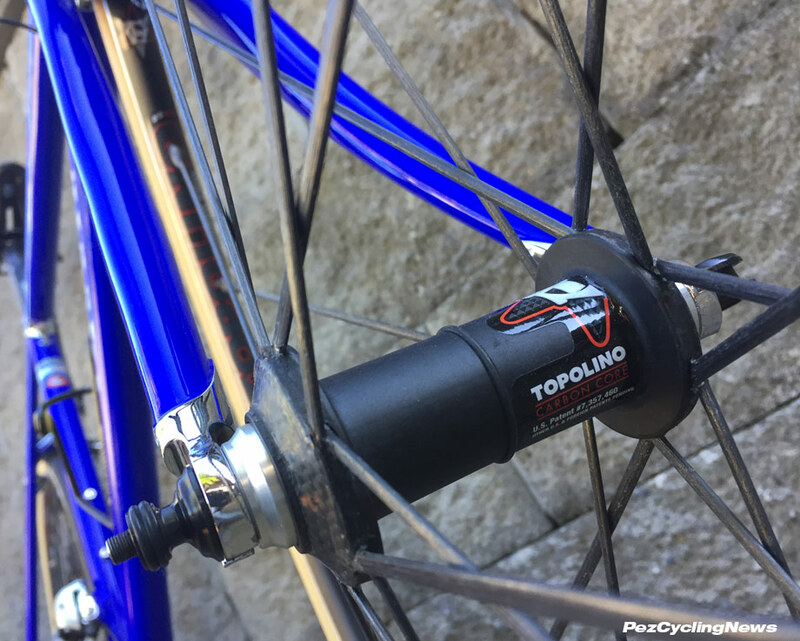 The wheel set was supplied by Topolino, a brand we reviewed here many years back, and sadly haven't seen enough of in recent years. 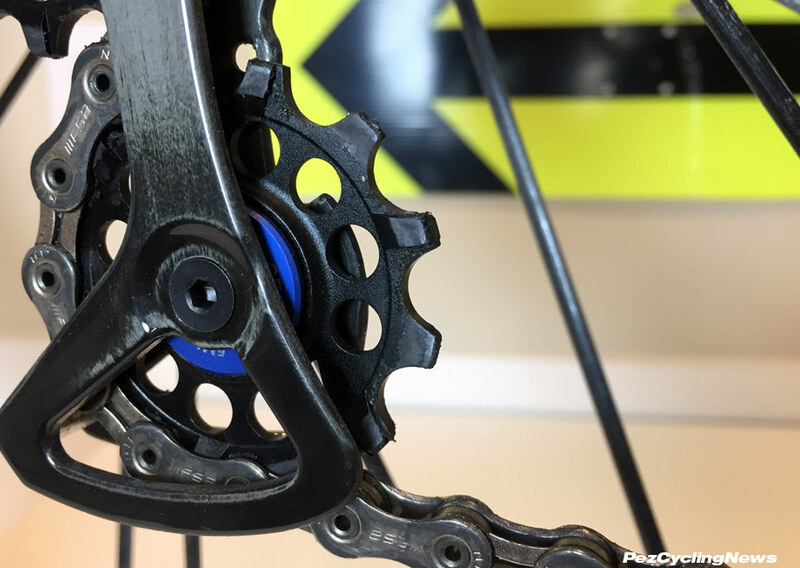 They feature carbon-core kevlar wrapped spokes that run continuously from the rim, through the hub to connect to the opposite side of the rim - eliminating the anchor point in the hub. The hub is essentially suspended in the center of the wheel by the spokes. Topolino believes this system adds strength and reduces weight. Tires were 28mm by Vittoria, but there looks to be enough room to fit 30mm skins if you wish - a current trend and one that's making a lot of sense given lower air pressures, better puncture resistance, more comfort, and even faster rolling just make for a better overall ride. I've written thousands of words describing the minute differences of how bikes feel, and sure, I've got some cred in this very subjective arena due mostly to having ridden dozens of different brands, models, and frame types over my 30+ year career as a cyclist. But I'm cautious about getting too wrapped up in my own BS, especially when trying to write different words to describe the exact same sensations I've felt so many times before. Steel has a distinct feel - it's stiff and efficient without beating you up. Modern production of steel tubes has given builders much more to work with when tuning a ride to their - or your specs. It's the least expensive material to get a custom geometry build with, and it's durable. My Doge tester was built with classic road geometry (which is how I like it), so predictability in all situations was solid. 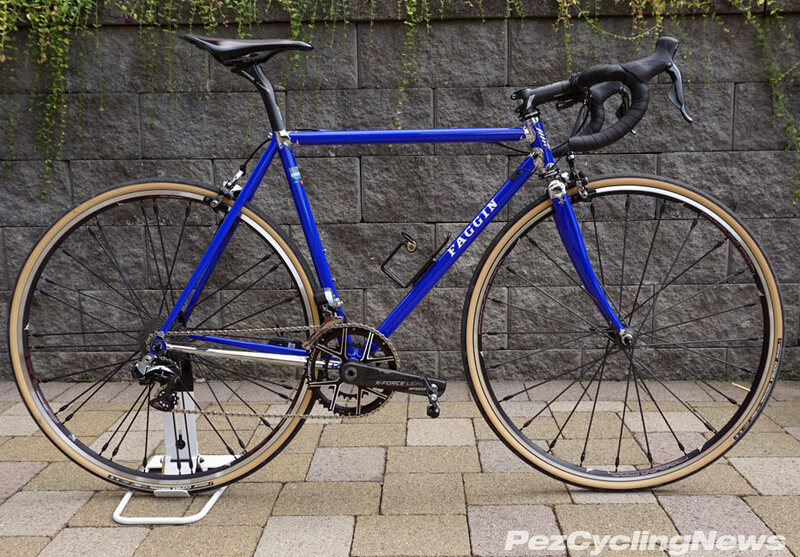 I took this bike on a lot of different rides this summer - everything from slow solo pedals to really fast group rides, and the Faggin felt great on them all. Oberland Imports nailed the fit with a 110mm stem (I normally ride as 100mm), and even though the bars ended up lower than I usually set them, I was pleased with the slightly new position. 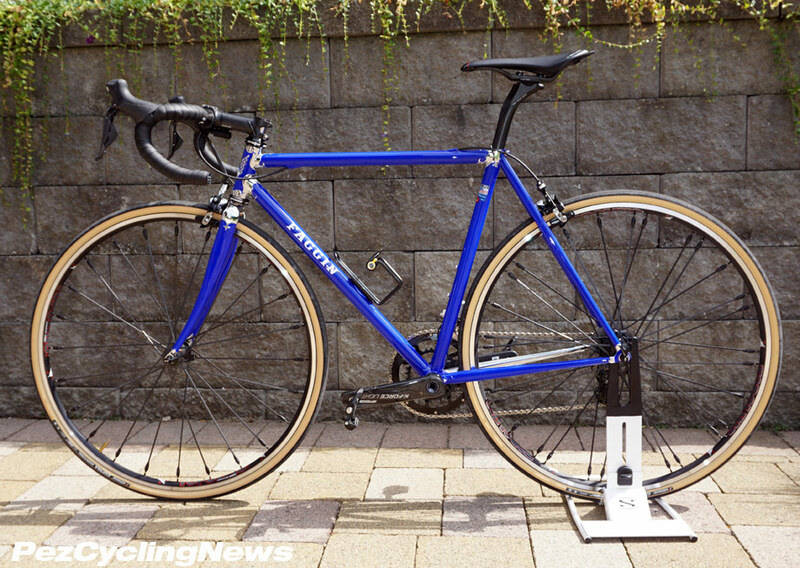 The 28mm tires added a level of comfort without giving up the speed of a 25mm tire. I like it so much that I'm migrating some other wheels over to 27-28mm widths - there's an overall feeling I really came to like riding this one that finally convinced me - sorta like my move from 23's up to 25s. This bike will appeal to anyone who wants high quality, craftsmanship, and something the rest of don't have. But when a brand has been honing their craft for over 70 years, you don't need me telling what makes 'em great. And maybe the only reason you've never heard of 'em before, is because they've been too busy building fine framesets to get out there and do the marketing. touch base with William over at Oberland.